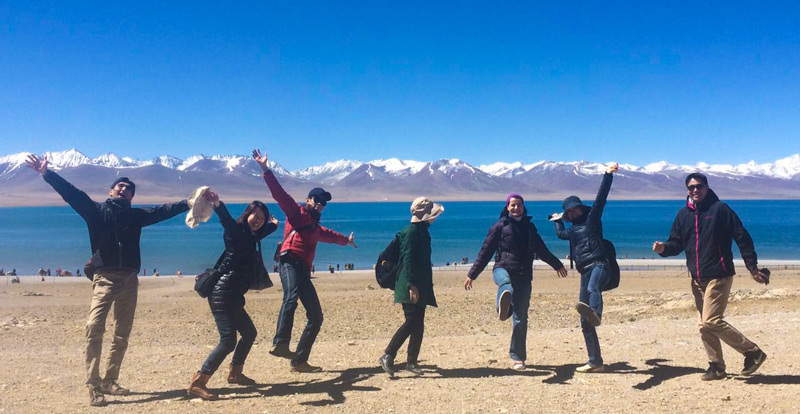 Ready for a Tibet tour but no idea about what to see in Tibet? Good news for you! Here are top 10 highlight Tibet landmarks. It will help you a lot for your Tibet travel. The second when you arrive Lhasa, you will embraced by the beauty of the capital city of the Roof of the World. Tibet is such a wonderland that attracts countless global travelers to come here. Besides, the deeper you explore Tibet, the more you get surprised for its rich culture, long history, colorful social life, typical tradition, and sacred religion etc. Here below are top 10 highlight Tibet landmarks that you should not miss when you travel to this wonderland. located in the capital of Tibet Autonomous Region, Lhasa, Potala Palace is one of the most spectacular and amazing places you will discover in the whole world. And this unbelievable structure has been used as the home of the Dalai Lamas for centuries. Furthermore, it is filled with thousands of well-preserved artifacts, marvelous statues, beautiful paintings and religious objects etc. The main building divided into two parts, the White Palace and Red Palace. The White Palace is the living quarter of Dalai Lamas while the Red Palace is devoted to religious study and Buddhist prayer. As an icon of Lhasa, Potala Palace is one of the must-visit attractions in Lhasa city tour. See more info of Potala Palace. 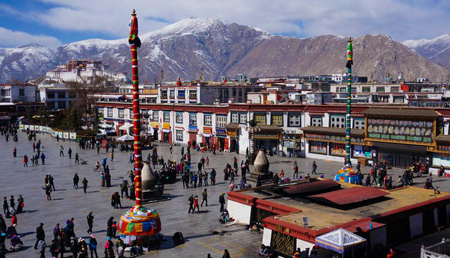 Jokhang Temple is a Buddhism Temple in Barkhor Square, Lhasa, the heart of Tibet. 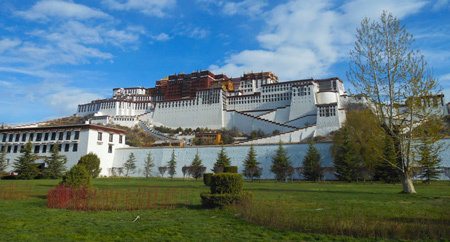 It is not only one of the UNESCO World Heritage sites but also one of the most popular tourist attractions in Tibet. Constructed in 642 by King Songtsen Gampo, Jokhang is said that this temple was founded for the king’s two brides: Princess Wencheng of the Chinese Tang dynasty and princess Bhrikuti of Nepal. Then it became an even more well-known temple after the Buddhist master Atisha taught here in the 11th century. Till now, it has a history of 1300 years and owns the supreme status in Tibetan Buddhism. See more info of Jokhang Temple. Known as the window of Tibet, Barkhor Street, locates near the Jokhang Temple, in the old town of Lhasa city, which is a popular ritual cycle for pilgrims and locals. 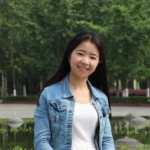 It has preserved well the tradition of the ancient city and the way of local livings. Moreover, the street also serves as a shopping street where travelers can buy many Tibetan-style souvenirs and handcrafts. Most travelers stroll around Barkhor after visiting Jokhang Temple. So they may spend hours to explore the local shops and feel the true Tibetan life here. See more info of Barkhor Street. Sera Monastery is one of the three Gelug University monasteries of Tibet. And the other two are Ganden Monastery and Drepung Monastery. It locates 2 Km north of Lhasa. Meanwhile, the monastery is dedicated to the Gelugpa (Yellow Hat Sect. ), a branch of Tibetan Buddhism. 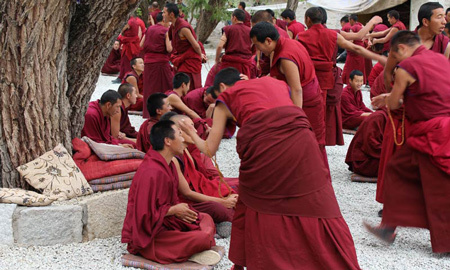 The debating of Buddhist Doctrines is the highlight of Sera Monastery among other monasteries in Lhasa. Monks gather together in the special debating yard from 3pm Monday to Friday to have debates. Generally, the debate lasts for an hour and a half. See more info of Sera Monastery. Drepung Monastery is the largest monastery in Tibet which locates at the foot of Mount Gephel, 5km from the western suburb of Lhasa city. It is one of the three great monasteries in Tibet while the other two are Sera Monastery and Ganden Monastery. The Monastery was built in 1416 by Jamyang Choge Tashi Palden, one of the Tshongkhapa’s main disciples. 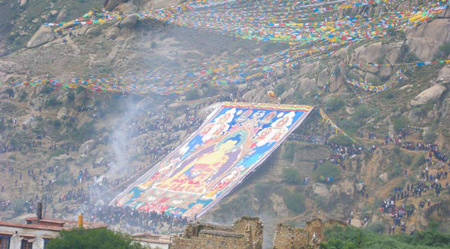 Thangka Unveiling is one of the highlights of Drepung Monastery during the Sho Dun Festival. Every year many visitors and local people come here to worship the giant Buddha on the Thangka which is about 20 metres wide and 30 metres long. Namtso Lake (Tibetan meaning: heavenly lake) locates in the central of Tibet Autonomous Region. It is the highest lake in the world and the second largest lake in Tibet. 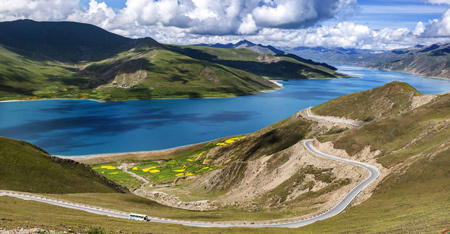 It is one of the three holy lakes in Tibet (the other two are Lake Yamdrok and Lake Manasarovar) and it is also one of the must-see attractions in Tibet tour. The distance between Lhasa to Namtso Lake is about 250km. The south of the Namtso Lake faces Nyenchen Tanglha Mountains which has a year-round snow over the summit. Yamdrok Lake (4,441m), also known as Yamdrok Yumtso or Yamzho Yumco, locates at the Nangartse County of Shannan Region. It is one of three largest holy lake in Tibet (the other two are Namtso Lake and Lake Manasarovar). What’s more, in Chinese Mandarin, Yamdrok has a vivid name, Coral Lake, for its irregular shape. Many short streams of this lake winding into the nearby mountain and it looks much like the coral. Mount Everest, Earth’s highest mountain (8844.43 meters) is located in the international border between China and Nepal. As the dominant peak of the Himalayas, Mt.Everest is considered as ‘the Third Pole of the Earth ’. Covered with snow all year round, its glacier area has reached ten thousand kilometers. As climbing Mt.Everest requiring a lot of money and time, so normally for most travelers, the Everest Base Camp is a best viewpoint to enjoy the beauty of this snow-covered mountain. 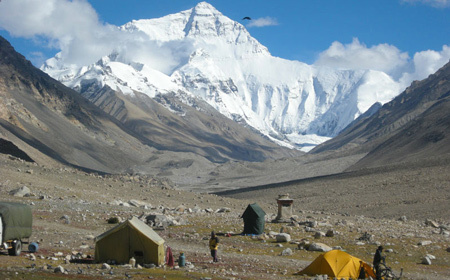 The base camp locates about halfway from Rongbuk Monastery which is the highest monastery in the world. Mount Kailash lies near the Lake Manasarovar in Ngari prefecture, Tibet. The two attractions are famous as Sacred Mountain and Holy Lake respectively. 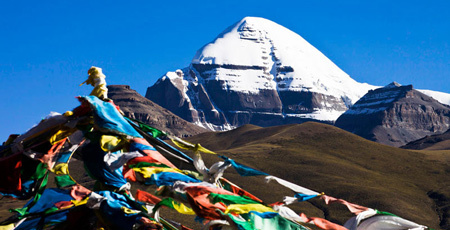 Therefore, the Pilgrimage Kora around Kailash and Manasarovar attracts countless pilgrims every year. Gangs Rin-po-che is the Tibetan name of Mt. Kailash. It is considered as a sacred place in four regions: Bon Religion, Buddhism, Hinduism and Jainism. Every year, thousands make a pilgrimage to Kailash for the faith they believed that circumambulating Kailash by foot will bring good luck and clear the sins. Moreover, the total miles of the Pilgrimage Kora is 53km. It usually takes 3 days for normal people or fewer days for local people. In addition, the trek begins and ends at Darchen where is at 4,575m above sea level. Lake Manasarovar is a fresh water lake at 4,590 meters above sea level. It is also one of the Three Holy Lake in Tibet. Hindus said that Manasarovar is the most sacred lake, bathing and drinking the water may cleanse all sins. The first Dalai Lama founded the monastery in 1447. Tashilhunpo means ‘heap of glory’ or ‘all fortune and happiness gathered here’ in Tibetan language. It regarded as a historic and culturally essential monastery in Shigatse, Tibet. It is also the largest functioning religious institution in Tibet. This monastery is located on the southern slope of the Nyima Mountain, in Shigatse city. 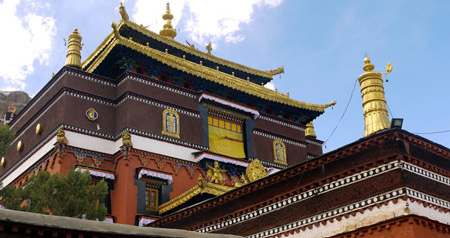 Since 1447, Tashilhunpo Monastery has been the traditional seat of successive Panchen Lamas (the second highest ranking Tulku lineage in the Gelugpa tradition.) Therefore, every year, believers and tourists from both domestic and abroad come here to travel and worship. 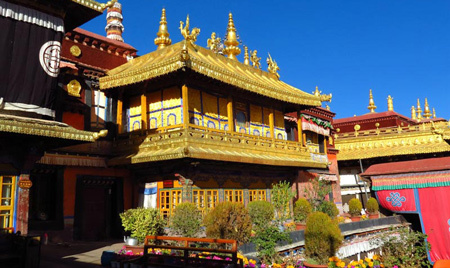 Besides the top 10 highlight Tibet landmarks, there are also many other attractions in Tibet that worth to visit, such as Samye Monastery, Norbulingka Palace, Draksumtso Lake and so on. See more Tibet attractions on our website, we have many tourists’ attractions of each prefecture in Tibet. Meanwhile, for further info about Tibet travel tips, please follow our Tibet Travel Blog.